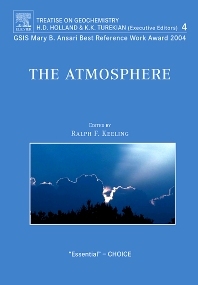 This volume covers topics relating reactive atmospheric chemistry, pathways for material transport within the atmosphere, and exchanges with the land, biota, oceans, and solid earth. The emphasis is on species of relevance to global climate and global chemical budgets, as well as on the application of geochemical methods, such as isotope techniques, for deciphering pathways and rates of material exchange within the atmosphere and with other reservoirs. The topics covered here have long histories, related to their importance for problems of global climate change, the ozone layers, and other global impacts on humanity. For more than a decade, my research group has been engaged in measuring changes in atmospheric oxygen (O2) concentration. Oxygen is closely linked to carbon dioxide by photosynthesis, respiration, and combustion reactions. We have shown that oxygen concentrations in the clean atmosphere vary with season and are slowly decreasing from year to year. By measuring these changes along with changes in carbon dioxide, we can learn about the fate of the carbon dioxide emitted each year by humans: How much remains in the air? How much enters the oceans? How much is taken up by land plants? Recently, I have also been engaged in developing theories for why atmospheric carbon dioxide was lower during Pleistocene glacial periods, and why the global climate was also highly unstable during these times.